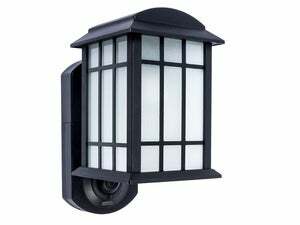 This outdoor light fixture offers a weatherized intercom and a built-in alarm to deter intruders, too. The Kuna smart Wi-Fi camera has now reached each and every eligible backer from last year’s successful Indiegogo campaign, Kuna Systems, the California-based startup behind the device, announced today. This suggests the company is now free to focus on making enough units available for everyone else. The market is crowded with home-security cameras, but you’ll be hard pressed to find many products like the Kuna. It’s an amalgam of outdoor light fixture, Wi-Fi camera, intercom, and alarm system. According to the company, this combination makes it ideal for stopping burglars or uninvited visitors right at the door. It was perhaps on the back of this promise that the company was able to raise nearly $230,000 from more than 1,500 backers in its one-month crowd-funding campaign. Kuna’s ability to detect motion means it can alert you to the presence of a potential intruder at the door. You can then not only proceed to watch the camera’s live video feed, but also interact with that person via a two-way audio link or a pre-recorded message. What’s more, you can do all this regardless of whether you’re physically present in the house. Kuna is designed to recognize different motion patterns—the swaying of trees is one example–so that it can keep any false alarms down to a minimum. And in case there’s a false alarm, you can use a mobile app to train the device not to repeat the mistake. The camera delivers 720p resolution with 2X digital zoom, and a viewing angle of 116 degrees. It features Wi-Fi and Bluetooth connectivity. You can also use the mobile app to control and program the light fixture itself, so that it turns on and off according to a schedule or so that it automatically turns on in response to nearby motion between dusk and dawn. 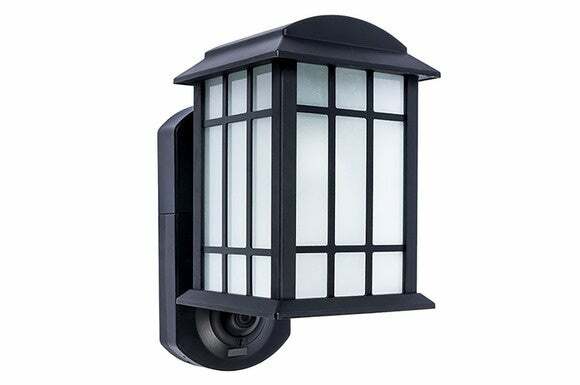 The camera element and motion detector are mounted just below the light itself. 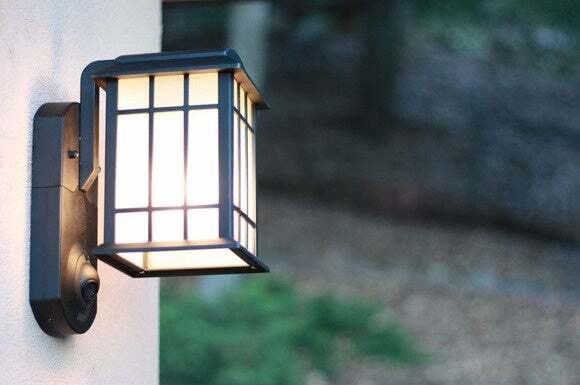 The porch light is available in three different styles and two different color options: Craftsman (black/bronze), Traditional (black/bronze), and Contemporary (only black). It is available online from Amazon and the company’s own website for $199 (optional cloud recording service costs extra: $5 per month). Why this matters: Yes, the whole idea of combining a light fixture and a security camera isn’t exactly original, but Kuna is a lot smarter and packs way more features than all other hybrids we’ve seen. At the same time, this approach has a number of inherent benefits that impart Kuna an edge over many other outdoor cameras with comparable smarts. Since it replaces your existing lighting fixture, you don’t need to worry about drilling holes or running an unsightly extension cord to its location. The fact that it’s both a light and a camera is a double-edged sword, though. On the upside, you don’t have an ugly camera messing up your home’s sight lines. On the downside, an ugly camera mounted on your wall can also deter a burglar from approaching—or at least encourage one to quickly leave the premises.